Let’s be honest, there are nearly as many bookmakers out there as there are bets you can place with them. Given that more are springing up all of the time too, it’s quite tricky to know who to turn to when it comes to sticking a bet or two on any given match. On this site I’ll give you my personal opinions on the different bookmakers that I have used in the past and continue to use now. It’s a saturated market and I feel that a bit of personal experience can go a long way to helping you to decide who to place your bets with. You’ll also note that I’m not giving you a big list of every betting site out there. These are the ones I recommend highly and here I’ll tell you a little bit about the pros and cons of each one. I’ll let you know who they are, what they do and what I like and dislike about the services that they offer so that you can make an informed decision about them. It’s worth considering joining more than one for the best odds, too! Place a single or multiple bet of £10+ at odds of evens or more for £30 in free bets. You'll also receive 30 free spins in the casino. To be eligible you need to deposit using a debit card (ie: no ewallets). Free bets added within 48 hours of your first bet settling and must be used within 7 days. Bet £5 for two £10 free bets and a £10 casino bonus. Minimum odds to qualify are evens and some deposit restrictions apply. Wagering requirements and time restrictions apply. T&Cs apply, 18+, begambleaware.org. Bet £10 at 1/2 or more for £30 in free bets (3 x £10). You need to use promo code 30f when depositing to claim. Bonus added once your qualifying bet settles and must be used within 7 days. T&Cs apply. The list (above) serves as a quick reference to all of the sites I am happy to recommend. Lower on the page I give you an overview of what it is exactly that I like about each site, to help you decide which is right for you. And if you want even more information, there are also links to my in depth reviews of the sites. Founded in 2003, 10Bet started life as a bookmaker aimed at attracting punters from the Asian market. More than a decade and a half later and it’s fair to say that they’ve grown a bit since then. They have active customers in more than 90 markets and the site’s parent company, Blue Star Planet Limited, is based in Malta. Regulated by the UK Gambling Commission, the’ve shifted their attention in recent years towards breaking into the British market. One of their chief tactics on that front is excellent football coverage, with over 150 different leagues coming under their eye. Moving from the Asian market to a more UK-focused one hasn’t necessarily been a plain sailing experience for 10Bet. There are numerous parts of the way their site is set-up that indicate their past experience and whether you like that or not will be a matter of personal preference. They’ve done well to ensure that they offer as much as possible, though, and it’s not just the football that they offer close to comprehensive coverage on. A quick look at the list of sports they cover will furnish you with some interesting options. Are you a big fan of futsal, for example? How about Aussie Rules football? Perhaps you’re a speedway lover and want to place bet on that on a regular basis? I wouldn’t go so far as to say that they offer the sort of coverage that you won’t find anywhere else, but I would be quick to point out that there’s enough sports and events off the beaten track to mean that those of you that like to avoid the mainstream will be more than happy with what they have on offer. In fairness, 'solid' is the byword for 10Bet’s coverage, if you want my honest opinion. Their odds are never going to blow the doors off their competitors, but they’re good enough to mean that you’re not going to shut down the website in disgust when you see them. Their horse racing coverage might not be all-encompassing, but you’ll be able to bet on plenty of races from across the UK and Ireland and even further afield. 10Bet have worked hard to establish themselves in a very competitive market and whilst they may not have the name recognition of a Ladbrokes or a Coral, what they have got is an interesting take on a crowded business. As I’ve hinted at, their prior life working on the Asian market means that there are aspects to their website and app that won’t be to everyone’s taste. On the flipside, if you like it then the likelihood is that you’ll really like it and be impressed with the way it’s all set up. For me, I like it enough to use it reasonably regularly. There’s a good streaming service, regular promotions that I think offer good value and a Best Odds Guarantee on horse racing that means I know I’ll never feel cheated with my bets. Have a read of the full review and see what you make of them. I think 888sport is a really interesting player in the online bookmaking world. Part of the larger company known as 888 Holdings, 888sport was set up in 2008 and have made impressive in-roads into the online betting market. 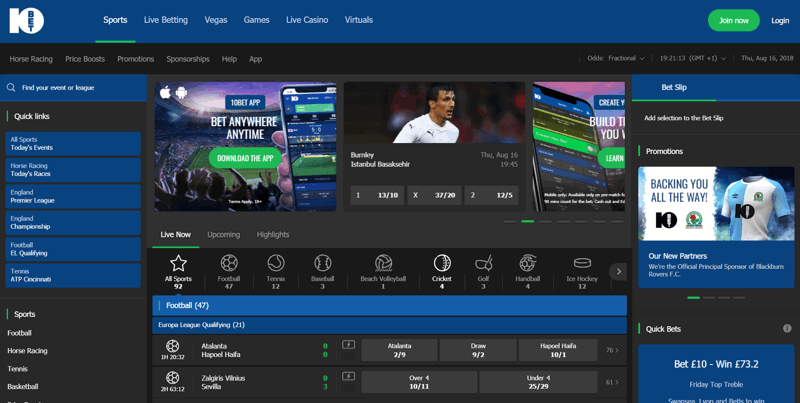 One of the new breed of bookmakers that is all but exclusively internet-based, the company has quickly established itself as being just as relevant and important as far better known competitors like William Hill. Operated under a subsidiary company called Cassava Enterprises, 888sport is still owned by the two sets of brothers that set it up in the first place. There’s no guarantee that just because a company has numerous different strings to its bow that automatically means that it’s going to be a success, yet that is surely a sign that those responsible for running it aren’t afraid to continue their expansion. So it is that 888 Holdings’s operation of the likes of a bingo site, poker site and casino must surely allows to feel some confidence in them. It’s also worth noting that they resisted a buyout from a different company in 2014, with everyone concerned believing that they’d created something special and keen to see it out. I do think that they offer something special, too. They have attempted to find some niches in the market, so you’ll be able to find odds on some really random sports. The stand-out one for me on that front is pesapallo, a game played with a bat and ball that is remarkably popular in Finland. Now you may well tell me that you know all about it, but I’m not ashamed to admit that I had to Google it to find out what it was. I consider myself to be reasonably au fait with the sporting world, so if I’ve got to Google something then I’m happy to say the company covering it knows what they’re talking about. 888sport isn’t flawless, of course, as so few bookmakers are. Their Cash Out option is tricky to navigate and hidden away enough to suggest that they’re not that bothered whether you use it or not. Given the importance of Cash Out on revolutionising the online gambling industry, I wouldn’t be surprised to see this approach change sooner rather than later. You’ll also be a little disappointed in their live streaming options if that’s something that you enjoy, with only greyhound racing and horse racing covered at the time of writing. All in all, though I think there’s enough about 888sport to win hearts and minds over time. They’ve had sponsorship deals with Nottingham Forest and Birmingham City that suggest they’re taking their football coverage seriously, whilst they’ve also got involved with the sponsorship of a stand at Fontwell Park Racecourse in the past. 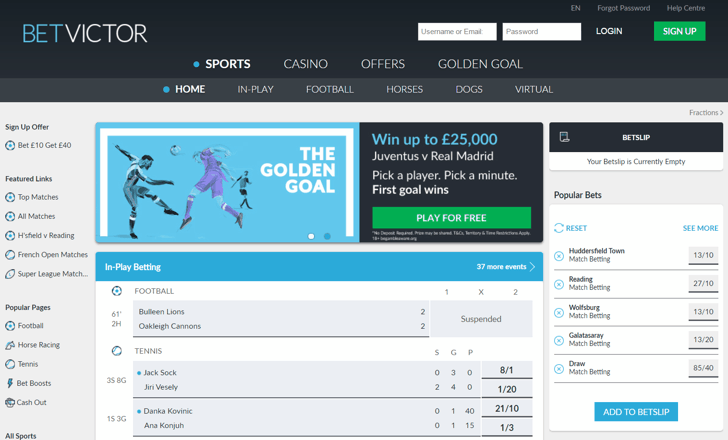 There’s a lot to like about the set-up of their website, with in-play betting being a particular treat in my opinion. That, combined with solid promotions and a website style that is appealing once you’ve got used to it, is enough to mean I head back to 888sport with regularity. Not every bookmaker can claim to have revolutionised their industry, but that’s certainly something that Andrew Black and Edward Wray can lay claim to. Their invention of the betting Exchange, whilst not being without some degree of controversy, has completed shifted the landscape when it comes to online betting. In fact, such is the influence of the Exchange on the way betting companies now operate, it’s impossible to talk about Betfair’s services without an in-depth discussion of the way the Exchange works. I go into it all properly in the main article, so I won’t repeat myself here. What I will say, though, is that it is an entirely different world to what you’ll be used to with fixed odds bookmaking. Of course, different isn’t always good. The reality is that betting on the Exchange can seem complicated to begin with and punters who aren’t familiar with it might be tempted to shy away. If you put yourself in that category then fear not, I do my best to explain how it works in my full review and Betfair do an event better job on their website. The best way to think about it is that you actually become the bookmaker, so instead of betting on one horse to win or event to happen, you can choose one that you definitely don’t think will win or something that you believe won’t happen. It’s exciting and rewarding, with no small degree of risk attached too. My advice would be to give it a look for sure. Now I wouldn’t be talking about them if all they offered was an Exchange that not everyone understands, so it should go without saying that they have a standard sportsbook for you to bet with too. It’s virtually impossible not to link it to the Exchange in discussions, largely because that side of the site ensures that their coverage is top notch. After all, what would be the point in revolutionising the industry and then not being able to cope with the demand that your revolution has brought about? Betfair’s football coverage is great, perhaps only rivalled by their horse racing coverage. In fact, the only part of things where I didn’t find Betfair to be up there with the best company’s around was in their coverage of other sports that people might be interested in. For a company that prides itself on leading the way rather than walking in the footsteps of others, I found their coverage of other sports to be decidedly pedestrian. Still, I’m yet to find the absolutely perfect bookmaker, which is why I always recommend taking a little from one and a little more from another. One thing that I haven’t yet mentioned but really should is Betfair’s business situation. In 2016 they merged with Paddy Power to form a new company called Paddy Power Betfair. Now the name might not be the most imaginative around, but what it means is that together they have become one of the most powerful bookmakers around. They’re still operated as separate companies, though, so don’t worry that you’re going to get confused about who you’re betting with. Betfred was founded back in 1967 and initially there was just one shop in Salford, Greater Manchester. The company was set up by brothers named Fred and Peter Done, with the former giving his name to the bookmakers. They grew year on year to the extent that by 2003 their turnover was around £550 million. As impressive as that may seem, the following year the turnover was believed to be in the region of £3.5 billion, so that will give you some idea of just how successful Betfred have become since those lowly days in the middle of the 1960s. Fred Done is a Manchester United supporter and you might well have heard of some of the stunts he’s pulled over the years to gain his company some good press. For example, head back to 1998 and Manchester United and Arsenal were battling it out for the Premier League title. So confident was Fred that his team would win that particular battle that he became the first bookmaker ever to pay out on bets before the result was confirmed. Arsenal went on to claim the title, making him look a little bit foolish. Not deterred, though, Done did the same thing towards the end of the 2011-2012 season, paying out on United to win the title ahead of the final day of the season. Manchester City, the club’s great rivals, ended up winning it on goal difference. All of that should give you an idea of the sort of company we’re talking about here. Betfred will often chuck a curveball at its customers in the hopes of winning some decent publicity, so keep an eye out for daily deals and exciting promotions. Their coverage is actually solid enough to mean that they don’t necessarily need to go for cheap tricks, so in many ways it’s fair to assume that they do these things for no reason other than to please their punters. Fred’s support of Manchester United is a sign that the company is likely to take its football coverage seriously, with their horse racing coverage equally as good. That’s because, in 2011, Betfred outbid all of their competitors in order to win the rights to buy the Tote from the British government. I won’t go into detail about what the Tote is here, but if you don’t know what I will say is that it’s a pools-type betting scenario specifically for horse racing. Ever since they bought it their horse racing coverage has improved year-on-year, so you’ll be delighted with what they offer if you’re a big fan of the Sport of Kings. Decent football coverage, decent horse racing coverage and decent coverage of other more random sports means that the best word to describe Betfred’s overall package is 'solid'. Personally I’m not a massive fan of the Betfred website, preferring to use their mobile app when I’m looking to place bets. That’s a preference that not everyone will share, but I thought I’d let you know about it so you’re forewarned and, therefore, forearmed. With more than 1300 on-street shops it’s fair to say that Betfred have come a long way since those early days in Manchester. They have plenty of name recognition to keep you reassured and the best thing about them is that they’re improving all of the time. The key factor that you should consider when it comes to BetVictor is that they are Liverpool Football Club’s official betting partner and in previous years they’ve also had deals with Chelsea. It’s fair to say, then, that they like their football and will often have special markets especially for Liverpool’s games. If you’re a big football fan then it’s absolutely worth looking out for deals and offers that are aimed squarely in your direction. Their association with two of England’s biggest football clubs is a sign that football matters and that they know what they’re talking about. Just as you would trust a bookie that sponsors a horse race to know about horse racing, so too you can believe in BetVictor’s coverage of the world’s greatest sport. As for the bookmaker itself, BetVictor was established in 1946; so even though they seem to have risen to prominence in recent years they’ve actually got a fair bit of history behind them. They are also officially recognised as having the best odds on the Premier League out of all of the UK bookies. They don’t necessarily have loads and loads of offers as there’s a bit of a limited range of bets, but what they do have is very good indeed. If you’re looking for strong odds then it’s definitely worth heading to BetVictor to see what they’ve got. More often than not you’ll probably find that if they’re covering the bet you want to make then they may well have the best odds for that bet. I’ve covered them in more detail on their own page, but what I would say here is that they’re one of my favourite bookies because they’re classy and their coverage of both football and horse racing is up there with the best. Based in Guernsey and Malta and with operations in the likes of Ireland, the UK, Germany and Denmark, Betway is part of the wider company known as The Betway Group. Established in 2006, the company took its time to make sure its approach into the betting market was done correctly. Once they’d gone some way to establishing themselves they went to great lengths to get a fair amount of name recognition. Their method included sponsoring big events like the Froch versus Groves fight at Wembley Stadium back in 2014. That was the same year that they took on a three-year sponsorship deal for the Premier League Darts, so by the time 2015 rolled around even non-bettors could probably told you something about the company. Now having name recognition and being a trustable enterprise are two completely different things, so Betway also made sure that what they offered was up to scratch with the big boys. They became the official sponsors of West Ham United Football Club, indicating their seriousness about providing top notch coverage of that particular sport whenever possible. I wouldn’t go so far as to say that they are entirely flawless when it comes to football, but they’re certainly a lot better than some of their competitors. There are some glaring omissions when it comes to the leagues that they offer odds on, but I’m certain that will change before too long. When it comes to horse racing in the UK and Ireland there are unquestionably two standout meetings during the National Hunt calendar. One of them is the Grand National, whilst the other one is the Cheltenham Festival. I think it tells us an awful lot about Betway’s intentions to become a stand-out bookmaker in the modern variation of that industry that they have sponsored the Queen Mother Champion Chase at Cheltenham. You don’t do that if you’ve got no intention of offering decent betting options to the punters you attract as a result. There’s an argument that their strong coverage of the horse racing and decent work on football meant that something had to give somewhere and if you’re a fan of a less-watched sport then you might be a disappointed. Don’t get me wrong, they still cover things that aren’t what you’d call 'mainstream', but I’d be hesitant to say that it’s the best coverage of anyone on the internet. Things like volleyball, handball, American football and darts are all on offer, but they’re not exactly the sort of sports you’ll be surprised to see a bookmaker has odds on. Still, one small weakness isn’t something I’d be quick to complain about. 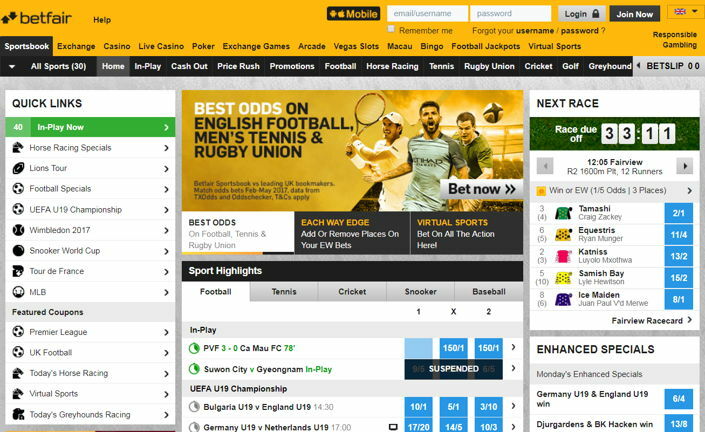 The reality is that there has been an explosion of newer online bookmakers since the industry really took off in the mid-2000s and the new kids in town like Betway have been quick to capitalise on it. They might not be flawless, but they may still surprise you in what they can do when compared to more established bookies that have been around for years but took longer to adapt to the new way of working. 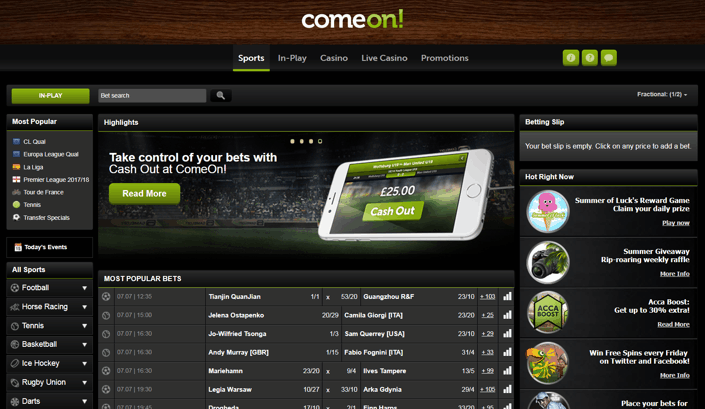 ComeOn was established as a bookmaker in 2010 and gained a UK Gambling Commission licence in 2015. Owned and operated by Co-Gaming Limited, they are based in Malta and have aimed their wares at the British market since the start. One of the ways that they got their name known to the wider betting public was by sponsoring Accrington Stanley when they were promoted back to the Football League. When you say Accrington Stanley to people of a certain age they will inevitably respond 'Who are they? ', to which you should reply 'Exactly'. Yet who they are is the 'team that wouldn’t die' and by linking up with them ComeOn got some good coverage at a time when everyone involved in football was talking about Accrington’s return. Now that wasn’t enough to get themselves the same sort of name recognition afforded to the likes of Coral, Paddy Power or Bet365, so they have strived to make themselves as different as possible from those well-established companies. Instead of jargon, complicated offers and a verbose approach to explanations of things, ComeOn promise 'no Shakespeare' and 'no Einstein'. Rather you’ll find they opt for clarity of explanation, keeping things simple and accessible so that you know exactly what’s going on at all times. Now just as name recognition wasn’t guaranteed simply because they sponsored Accrington Stanley, so too keeping the way they do things nice and clean isn’t enough in and of itself to ensure the business rolls in. That’s why you’ll often find that ComeOn’s odds are some of the best around or, at the very least, are very competitive. I give examples of this in my full review, so it’s worth a read if you want to know specifics. Speaking vaguely here so as to maintain the surprise, they had better odds on some horses in races also covered by one of the best known bookies around and they matched the odds on the other horses. Their coverage of football is some of the best around, in my opinion. You can delve into different tiers of leagues from around the world, meaning that there’s barely a division of football that you won’t be able to bet on via ComeOn. You can also get involved with bets that aren’t specifically about matches or results. As an example, you can have a look at odds on where players will end up at the end of the transfer window, if it’s that time of year. Handy if you like to have a flutter on the movement of players. The truth is that ComeOn doesn’t have the same level of recognition as many other bookmakers, but that doesn’t mean that you shouldn’t have a look at what they’ve got to offer. Personally I’m a big fan of the way they operate and I’m happy to recommend that you use them. The way in which the online bookmaking industry has taken off and developed since the proliferation of the internet means that they offer plenty to rival more established companies and you can even take advantage of offers and promotions designed to make them a more attractive option. Coral are probably the best ‘all-rounder’ that I recommend using. They’ve got a really good mix of strong odds alongside a decent range of bets that means they’re well worth considering for all your betting needs. I’ve heard some people suggest that Coral are a ‘vanilla’ bookies, but I think that’s really unfair as there are loads of things that they offer. They are less about the ‘bells and whistles’ than some of the other sites, though, so if you like an all-singing all-dancing place to put your bets on then you might be a tad disappointed. There’s really no reason to be, though. Coral aim more for convenience than anything else. You can make deposits and withdrawals on your account in their high-street stores through the Coral Connect System, which is a brilliant thing if you either don’t trust online banking or you’re out and about and need some readies for your afternoon and know a big win came in the day before. 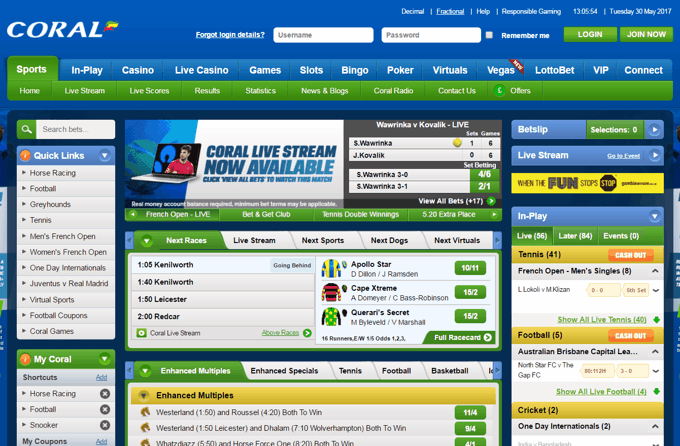 The website is nice and clean and has a look akin to the mobile sites or apps of other bookies. There are also pleasant little added extras that make betting with Coral a nice experience. You can Cash Out bets placed within a high street store, for example. You can also opt for a Partial Cash Out of certain bets if you’re not 100% confident which way an event is going to go. Neither of them are life changing, but they’re very much the sort of small things that can make a big difference in a very crowded industry. Their promotions are a little lacking, if I’m honest, but they make up for it in other ways. For example, users of their mobile app can quite literally make up their own bet for football games. You can choose a player, pick a stat like Shots on Target or Passes Completed and then bet on the Over/Under. Coral uses Opta for their stats, so they’re about as accurate as you can get. Horse racing fans like me will enjoy taking advantage of their Best Odds Guarantee and their live streaming of all UK and Irish racing. I would be lying if I said I thought Coral was the very best bookmaker you can bet with, but at the same time I think they’re really strong. Their offers are found wanting quite a lot but their features are up there with the very best of them. As I said at the start of this intro, they’re a very strong all-round bookie. Ladbrokes was founded in 1886, adopting its name in 1902 when the company moved to London. The business suffered during the Second World War and was bought out by Mark Stein and his cousin Cyril. It proved to be an inspired move by the Steins, who were quick to take advantage when the government legalised betting shops in 1961. They ploughed the profits from the more traditional parts of the company into creating a chain of high-street betting shops and remain one of the most easily recognisable bookmakers to this day. As well as attempting to dominate the betting shop side of the gambling industry, Mark Stein was also the first bookmaker to to introduce fixed odds for football betting. Now none of that is all that relevant to the sort of experience you’re likely to enjoy from Ladbrokes today, but it’s good to know that you’re dealing with a company that has a strong history within the industry. 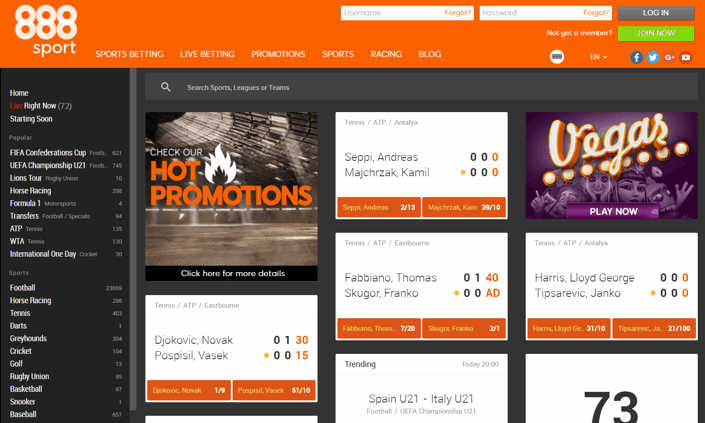 Given so many new bookies spring up all of the time and Johnny-come-lately type companies try to take over the online betting market, going with the tried and trusted isn’t all that bad of an idea. Much like Coral, which is another on-street bookies, Ladbrokes promise a good all-round experience. Plenty of solid odds, a nice selection of markets and a reasonably pain-free experience is the order of the day here. Also like Coral, you can make deposits to and withdrawals from your account via the Ladbrokes high-street shops. A nice convenience that other, purely online, betting companies can’t offer. they’ve also got a clean and simple to use website and app. As is the case with Sky Bet, there are loads of price boosts available through Ladbrokes, especially when big football games come around. Is the weekend of the Manchester derby? They might offer 5/1 for the Red Devils to win as opposed to the 2/1 being offered elsewhere, for example. One of their neatest things, though, is the ability to edit your accumulator after you’ve already placed your bet. That means you can take out one of the legs of your acca if you’ve changed your mind about it. Not bad, should you suddenly get some team news that alters your whole approach, or get a tip off about a horse that is a 'dead cert'. The online betting industry is, as I’ve said many times before, a decidedly crowded market. There’s no harm, therefore, in looking for a bookmaker that has a decent pedigree. Ladbrokes started out as a commissioning agent for horses trained at Ladbrokes Hall - hence the adoption of the name - and, as I’ve already said, later became the first bookie to offer fixed odds on football. Their success has been based largely around their ability to get things right with both football and horse racing. 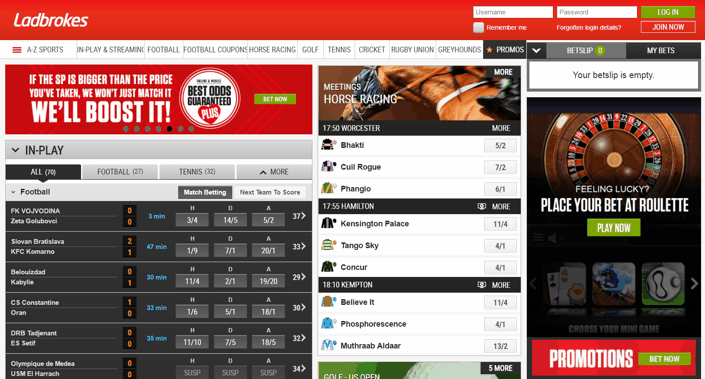 As they are my two favourite sports, I’ve got a lot of time for Ladbrokes. It’s all well and good me giving you guides to different bookmakers that you can use the services of, but if you’re relatively new to the world of betting online then you might well ask the question: is it safe? Certainly plenty of people are still wary of entering into monetary transactions online, so it’s only right that I do my best to answer the question as honestly as possible. The short answer is a loud and resounding ‘yes’. Security regarding finances online has developed year-on-year, with safety now of paramount importance to most reputable companies. The problem, of course, is that not all companies are reputable and so it’s vital that you only sign up for bookmakers that have a licence issued to them by the UK Gambling Commission. For the record, I only recommend bookies that fit into that category, so if you like the sound of one of the ones that I’ve spoken about on this site then you’re good to go. One of the main reasons why it’s always sensible to keep an eye out for a license issued by the UKGC is that they heavily regulate the industry. There are numerous hoops that companies need to jump through in order to pick up one of those licences, so you’re about as protected as it’s possible to be as long as they’ve got one. Sometimes things don’t go quite to plan, of course, and when that happens you’ll want to know that there’s somewhere to turn. Thankfully there is, with that ‘somewhere’ being the Independent Betting Adjudication Service. Better known as IBAS, it’s approved by the Gambling Commission and provides an Alternative Dispute Resolution service for customers who feel they’ve been let down by licensed gambling operators. Obviously the most important thing is for you to be as sensible as possible when you’re surfing online. Any company worth their salt that is asking you for financial information will provide you with a secure site to enter that information onto. If in doubt, check the address bar. Bookies that are 100% safe to bet with say “https” at the start of their address. That isn’t always the case, with a quick look by me just now throwing up both Coral and Betfred who don’t do that. In that instance you’ll be able to trust the brand, but just double-check the address you’ve entered and make sure it doesn’t say C0ral or Fretbed. It’s easy to do and will avoid you any embarrassing phone calls to the bank in the future. Generally speaking you’ll be fine, but being as sensible and wary as you can will stand you in good stead. Just as your taste in clothes and the sort of things you like to eat are extremely personal, so too what you look for in a bookmaker will come down to the sort of thing that you like from a company. There are numerous things that will differ from place to place, however, so knowing what to keep an eye out for will certainly help you limit the choices you have available to you. One of the most obvious things on that front is the odds that they offer. I tend to place a number of smaller bets rather than one big bet when I have a flutter, so I tend not to worry too much about odds unless they’re vastly different from one bookmaker to another. You might really care about getting value for your money, though, so going to the company with the best odds might be your be-all-and-end-all. From a personal point of view, one of the most important things for me is whether a bookie’s website is easy to use and whether or not they’ve got a decent mobile app. Given how much time you can spend surfing a site to find the events that you want to bet on, it can be a real wind-up if the site is slow or counter-intuitive. I also tend to do a lot of my betting whilst I’m out and about, so that why the mobile app matters. Are they the sort of things that matter to you? If not, are you keen to use a company that has really good offers? Some are much better than others on that front, so making sure you find one that tends to regularly give decent promotions might be your number one thing. Someone else might prefer a bookmaker that seems to really value loyalty, deciding to use just one company rather than flit between a number of them. That’s something else to keep a lookout for. Note: On this site you may notice that I don’t often talk about offers. That’s because I’m more interested in the bookie as a whole, rather than focusing solely on free bets. 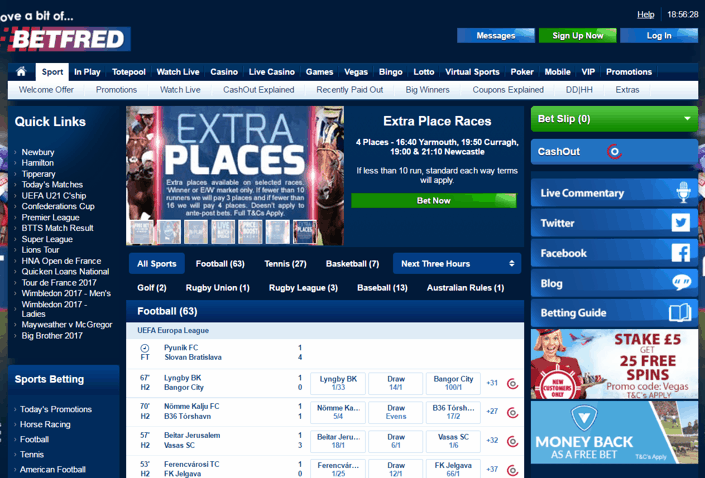 I do also run a site that lists betting offers for both new and existing customers though which you can find here. One of the big things I talk about in my reviews are the features offered by each individual bookie. The reality is that the majority of the big boys tend to match each other in terms of both odds and features, so if there’s one that does something you like better than others then you’re always likely to lean slightly more towards it. Most of the bets that I place nowadays tend to be In-Play, so I always tend to login in to my account with the bookmakers that favour that particular feature. I also tend to Partially Cash Out fairly often, so there wouldn’t be much point in me using a bookie that doesn’t even have a Cash Out feature. You might absolutely love to Live Stream whatever you’re betting on, in which case find a bookie with a great Live Streaming service is vital. The final thing I’ll mention is market depth. Everyone has their own preference on what they bet on, so finding a bookmaker that covers your favoured sport can make all of the difference. If you’re a horse racing fanatic, for example, then RaceBets will be your first port of call nine times out of ten. Liverpool fans might want to look to BetVictor because of the company’s arrangement with the Reds that sees them offer specific odds on a regular basis. That’s the sort of thing you’ll need to work out for yourself and have a bit of an experiment with a few different companies before you find the one for you. After all, if you’re desperate to bet on the fourth division of Danish football and the bookie you’ve joined doesn’t cover it then you’ll be looking elsewhere pretty quickly. As I mentioned at the start of this section, it’s ultimately a matter of personal choice. You will know what matters to you so have a good long think and have a look at my reviews and keep an eye out for whether or not each bookmaker ticks your personal boxes. If they do then get yourself signed up and start placing a few bets – you’ll soon learn if you’ve called it wrong. Ultimately you might think that it’s worth sacrificing something like decent promotions in exchange for a site that you can use really easily and find intuitive. Much as I wouldn’t tell a vegetarian to eat a steak or a fashionista to wear plaid trousers, so too I can’t tell you which bookmaker is for you. Hopefully my reviews will give you a really good idea, though, and you’ll be able to confirm that through usage of the sites themselves.